Hundreds of people have signed a petition against plans to build 20,000 homes in Leicestershire. 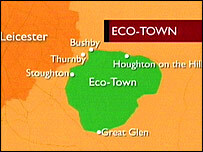 Campaigners said the planned eco-town south of Leicester near Great Glen would ruin the mostly rural area. The idea is part of a government programme to create 10 carbon neutral settlements across the country. The petition, on the 10 Downing Street website, has seen a surge of support as the date for a decision gets closer, campaigners have said. One of the campaigners, Councillor Kevin Feltham, said they would be holding a public meeting next month. He said: "It's important really that members of the public who perhaps haven't been as up to date as some people... need to be brought up to date with what we know as of now and what there is they can do about it. "They need to know how they can contact the relevant ministers, obviously write to their MPs and write to the Co-op themselves." The Co-op, which owns much of the land concerned, said the plans would be submitted to the government and, if short-listed, there would be a full public consultation. More than 50 proposals have been sent to the government and a decision is expected in February.